One luxurious, but unheralded, aspect of a home spa is excellent bathroom task lighting. 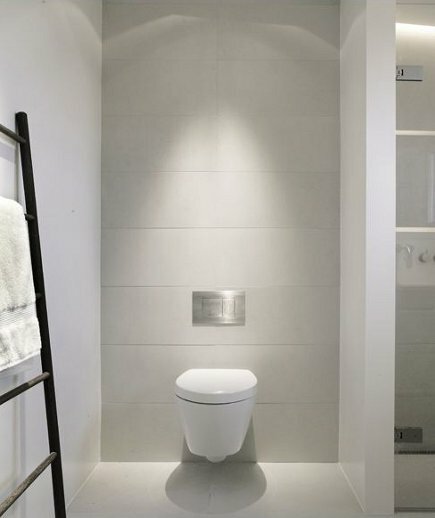 Bathroom task lighting often gets short shrift or is completely ignored. I’m reminded of how little attention is given to this area almost every time we stay at a hotel or in someone’s home. Rarely is the bathroom mirror lit well enough to see the detail we all need at various times. The same holds true inside a shower, in the commode area or below the sink where essentials are stored. Under sink storage, however, is deftly solved by the lighted Robern Vanity Drawers in one of my past posts. Mirrors with integral lighting tend to be modern and streamlined. 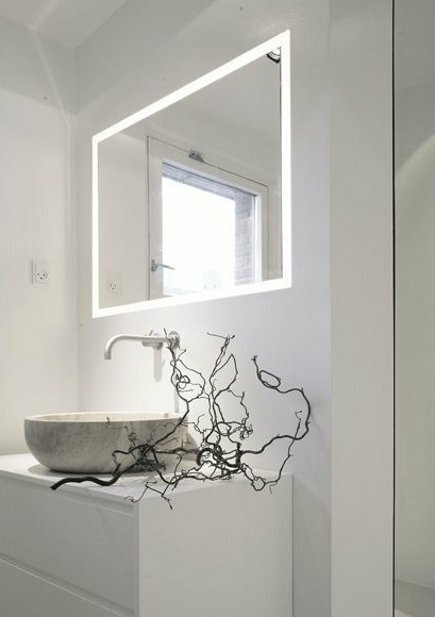 The frame on this one, in this all-white Danish architect’s bath, is super sleek but a lighted frame like that lets you see well when applying makeup, giving yourself a mini-facial, flossing teeth, or shaving because your head is not blocking overhead lights. Commodes are often sometimes in dark areas though this one is not. The photo speaks for itself. In a Florida powder, room designer Pepe Calderin provides a brilliant lighting blueprint overhead for general illumination plus lighting along the top and bottom of the long mirror. Additionally, there are lavishly puck-lighteded stainless steel shelves used for displaying crystal figurines. No problem with seeing anything in this space! Covering the ceiling with mirror also magnifies the entire effect in a unique way. Since our shower door exploded and 7 of us having been sharing one shower, we’ve had a time dealing with the wet towels. That rack in photo #2 looks like a great solution. I’m a huge fan of my recessed cans. They give such wonderful overall lighting. I’ve got a project going in that area and will have a lot to share very soon. Must confess that the stainless shelves are the least favorite bit in that bathroom but they are handsome nonetheless. Suppose that ladder/towel bar is old/salvage. But seems that two of these 3-part hooks or one 3 and one 5er would do the trick for you. Thanks! That is a cool little space-saving gadget, and has character, too. Can you give me the manufacturer information on that mirror with lights in it? 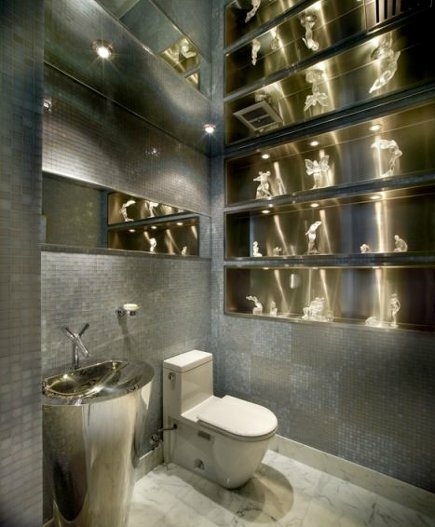 The bathroom with the illuminated mirror is from an architect in Denmark. No way to tell if it’s a bought mirror or a custom installation. So no manufacturer available.